“Support federal legislation to staunch the flow of deadly synthetic opioids through the U.S. Postal Service (USPS)…. 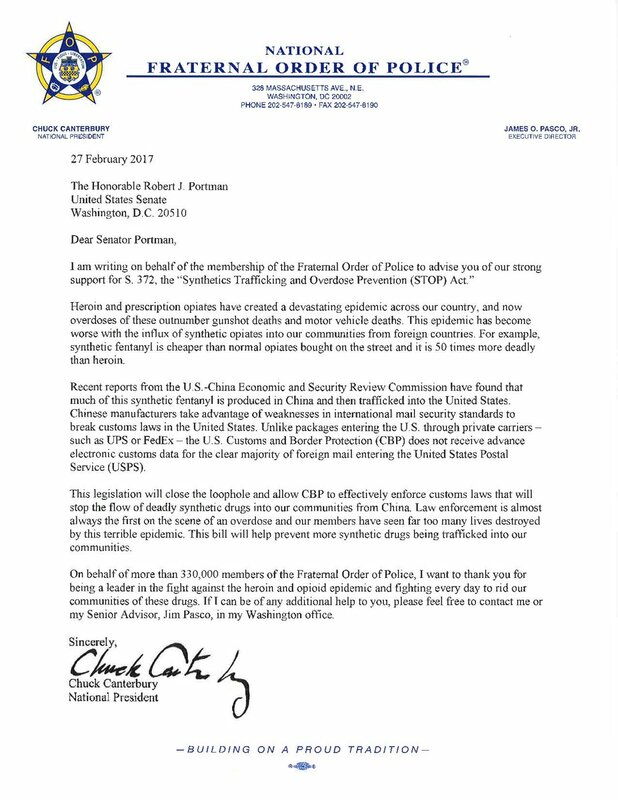 The STOP Act is a bipartisan bill seeking to close a dangerous loophole in our global postal system by requiring all packages shipped from foreign posts to include advance electronic security data, which law enforcement officials can use to screen and stop dangerous packages before they enter the country. The bill has 22 co-sponsors in the Senate and 222 in the House of Representatives and has been endorsed by many organizations including the Fraternal Order of Police (FOP) and the American Medical Association (AMA).